Not so sunny this week! Seems like the weather often does a quick change the day after I update the weather blog! On Saturday, and for most of the preceding week, we had "almost perfect" weather. There was some rain on Saturday here and there, and more importantly the west winds started to blow again. So I guess it was not a total surprise to have a wet Sunday. A very wet Sunday, wind blowing, rain lashing down for half the day. Wettest day for ages. One of those days when, should someone come into the dive shop, I say "You should have been here last week"! Were the sea conditions really that bad? Well, the Phuket Gazette reports that a Bulk Carrier transporting over 1000 tonnes of logs sank due to heavy seas off Phang Nga, just north of Phuket. Says the waves were 2m, wind 35kph maximum. That certainly should not be enough to sink a big boat. The archive data on Windguru and on the Nai Yang beach weather station (see links on the left of the page) also show no really strong winds. How odd. Monday was also a bit wet, less so than Sunday.. even a bit of sun later on in the day. I promised some customers some sun on Tuesday for their dive trip.. and lo! Tuesday was a nice sunny day. Just call me .... who are the weather gods? Google search... Well, the best known "sun god" would be Ra (Egyptian), but there is also Helius (Greek) or Inti (Inca) or Surya (Hindu) to name but a few. Meanwhile, if you want rain, just call Zeus (Greek), Tlaloc (Aztec) or Frey (Viking). All the old civilisations had a hatful of deities all with their own specialties! Does God control the Weather? Does He send deadly storms? He has His reasons, apparently it's far too complicated for us to understand. And anyway, don't worry coz Revelations tells us that God will clean up the world eventually, only allowing believers into the new world where there will be NO bad weather. Ever. At the risk of offending God squad readers, I will make no comment. Here's a couple of photos... 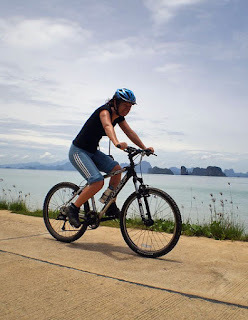 Thanks to James at Amazing Bike Tours - they had some cycling tours at Koh Yao Noi on Sunday and Tuesday. 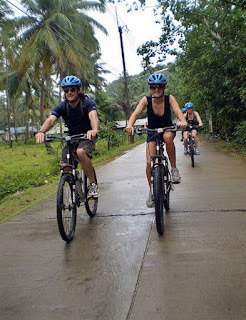 Yes, Sunday in the rain! But you know they say rain always looks worse through a window. Once you're out in it, once you are already soaked, it's not so bad! Well, that argument applies here, as the rain is warmish. Does not apply to Yorkshire. Wednesday already? A bit wet today, too. Not a sunny day. For absolute latest weather, right now, check the links on the left (webcam, weather station, weather radar in particular). So, let us pray for sun.